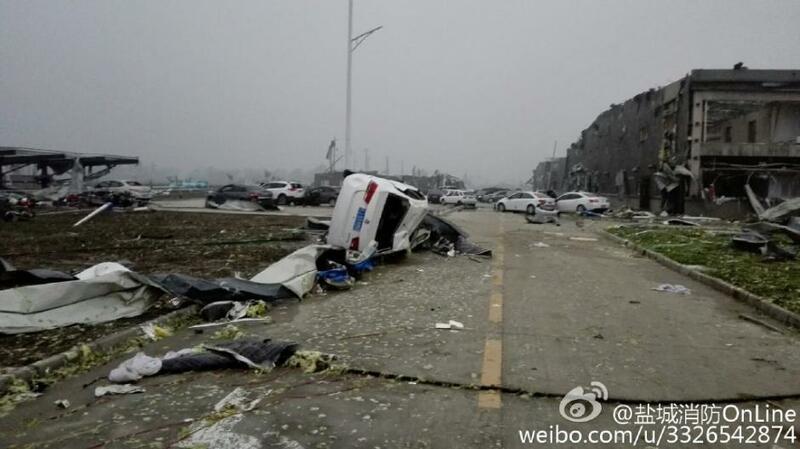 As unexpected as yesterday’s storm that hit the Jiangsu city of Yancheng [盐城] and left at least 98 people dead and hundreds injured there and in surrounding counties, the response thus far from Beijing has been fairly predictable. As if the Jiangsu government and the local authorities in Yancheng needed such guidance, or weren’t doing all that already. Which, of course, they most certainly are--as accounts from the scene make very clear. 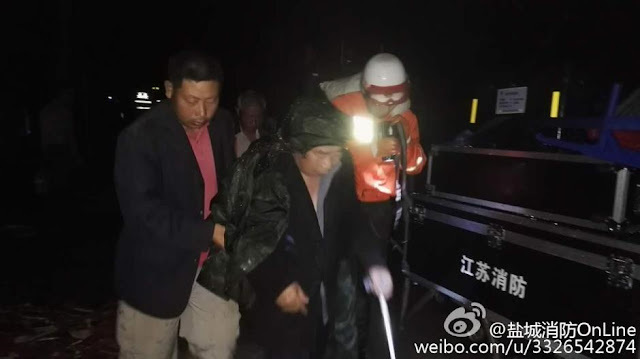 As with so many other local disasters in China, firefighters, rescuers, hospital personnel, and volunteers are all pitching in to try to save survivors and secure the area, even as thunderstorms and violent weather threaten to reappear in Yancheng. 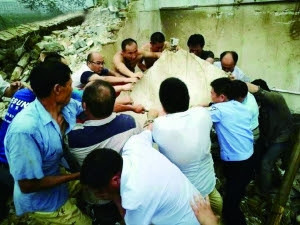 If there’s anyone “giving important instructions” in Yancheng and counties nearby, it’s residents working to lift collapsed structures and stretchers carrying the injured. That local courage may not have been immediately apparent to viewers of Chinese Central Television this noon hour, as the news spent over 20 minutes on President Xi Jinping’s presence and speech at the annual Shanghai Cooperation Council meeting in Uzbekistan. 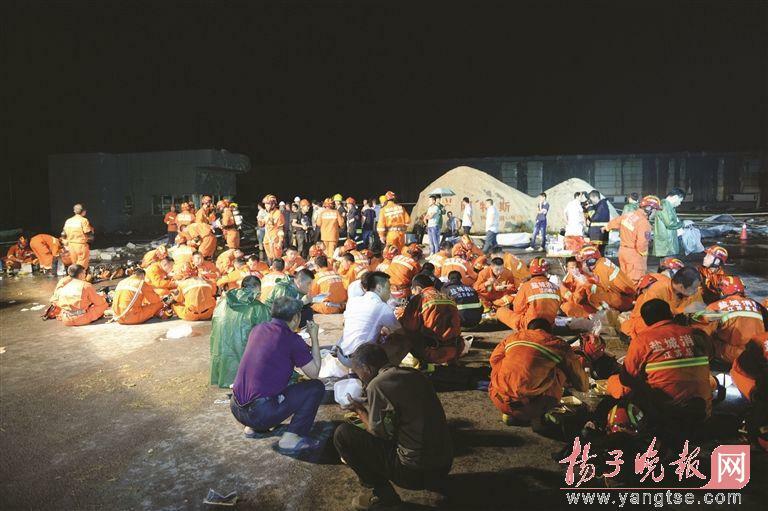 Only at the bottom of the hour was the disaster in the Yancheng area spoken of. Jiangsu television, on the other hand, spent the bulk of their news program interviewing local residents and showing scenes in the aftermath of what now appears to have been a cyclone that appeared out of nowhere to devastate the city and its citizens. China's central and China's local were on very different channels. This tragedy struck at a time when Yancheng is trying to make a future for itself. In earlier dynasties, the city had been the historical center of much of China’s salt industry, but it’s now like so much of Jiangsu’s northern region known as Subei [苏北]: a previously poor area sluggishly being refashioned as a high-technology zone. Places in Subei such as Yancheng have benefitted in recent years from online commerce and the willingness of Internet shopping companies to set up warehouse and distribution facilities on farmland that wasn’t very productive anyway. And Yancheng’s local government has been actively promoting a greener city in an effort to make it a more attractive place to live and work. But rulers and ruled still struggle with situations. Many residents of Subei remain largely unskilled, as the sorts of industries that made Jiangsu affluent in the past 2 decades passed Subei by, and the soil there isn’t well-suited for farmers to get rich either. For years, many Subei residents have long migrated elsewhere in search of work as construction laborers, house movers—taking any job as better than what they left. Many city dwellers in Jiangsu poke fun at people from Subei as uncultured and lazy, incapable of finding their way. But it’s difficult to find anyone here making such statements today. 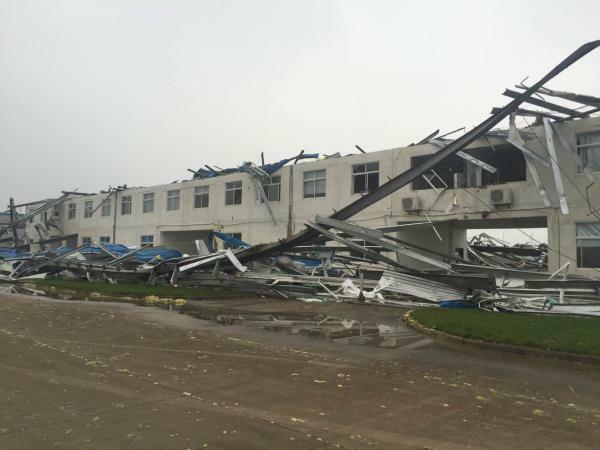 What is being spoken of, albeit quietly and carefully, is why there was no warning of the high winds that hit Yangcheng and the other counties that were struck, killing so many and laying waste to so much. According to one published report, as early as June 20th, there were predictions of heavy rainfall in Yancheng in the following days, but that rumors of widespread flooding spread so quickly through the social media platform WeChat that the Yancheng City Meteorological Bureau was besieged by phone calls from residents asking why the official forecast differed so much from what they were reading on their cellphones. That difference, local officials conceded, produced “a certain degree of anxiety and panic, and disrupted the social order.” Nothing further was mentioned in official media of the potential for violent weather. Chinese weather forecasting has been chastised before for being unprepared to “meet the needs of society”, but it’s Beijing that defines those needs, not local governments. Cyclones in Jiangsu are very rare events to start with, but they have happened. At the same time, since May 2015, Chinese law notes that anyone spreading false weather forecasts, or altering meteorological forecasts, which cause “socially adverse reactions”, is subject to criminal investigation. That latter prospect in itself may well have made local meteorologists disinclined to raise even the possibility that strong winds might cause devastation, because they’ve been commanded to value social stability over preparing the public for the possibility of worst-case scenarios. Still, it’s difficult to see how anyone could prepare for such a devastating event, especially when local governments were recently told to pay close attention to rising water levels, not the possibility of sudden storms. Plus, Chinese officials are not always trusted when they do issue genuine warnings to the general public. Today continues the rescue and recovery phase in Yangcheng and the areas that adjoin it. It’s not easy to know what to expect from the aftermath of this calamity, but it will be interesting to see which high official from Beijing visits, and who locally—if anyone—is held to blame for a tragedy that may have been incapable of being forecast in the first place.